The elevated cabin does a good job of convincing glampers they are sleeping under a canvas of trees, as if they were in a tree house, and not in a modern rental—thanks to the high ceilings, large windows, and exposed overhead beams. 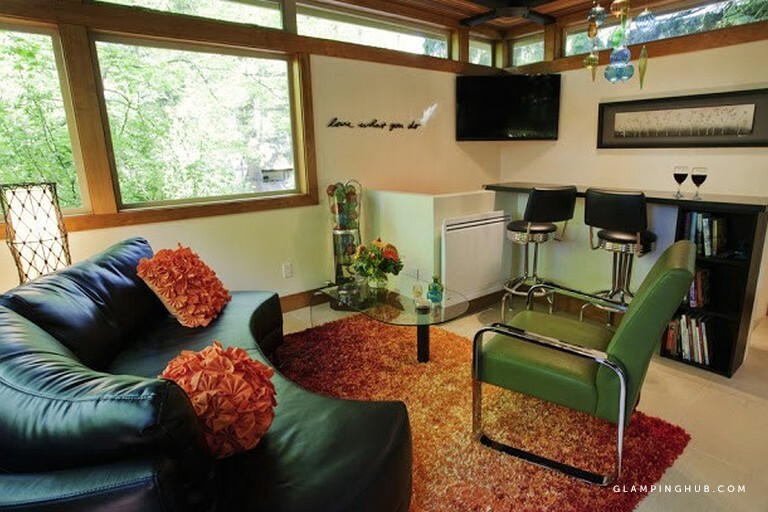 The cabin rental has two floors, filled with modern amenities and quirky furnishings. 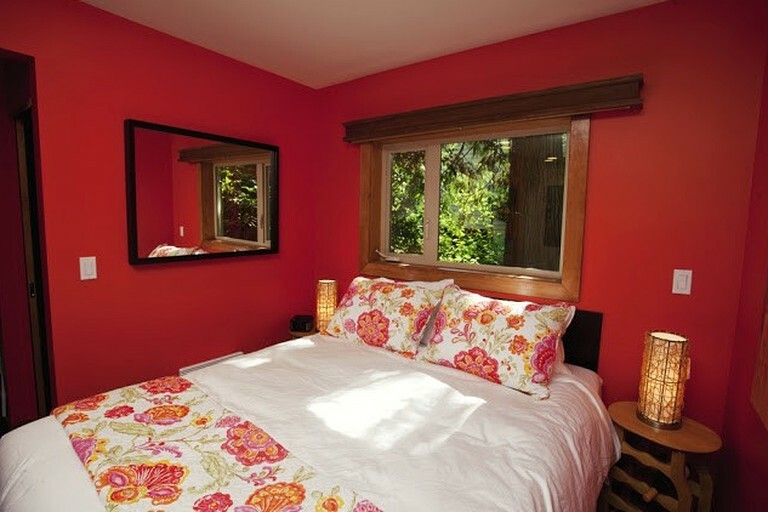 It is well insulated, so guests are kept cool in the summer, and warm and cozy in colder months. In addition, this elevated cabin also comes with Wi-Fi should guests wish to stay connected to the outside world. The foyer instantly oozes glamor, with welcoming red tones and chic furnishings. The old school chalk board allows glampers to note down anything they wish, or to simply doodle whatever comes to their mind. The bedroom is on the lower floor. It has a queen-size bed, with a European pillow-top mattress, and glampers have a choice of down comforter or blanket, as well as down or fiber-filled pillows. It has a small closet, a six-drawer dresser, and plenty of storage for luggage under the lift-and-store platform bed. 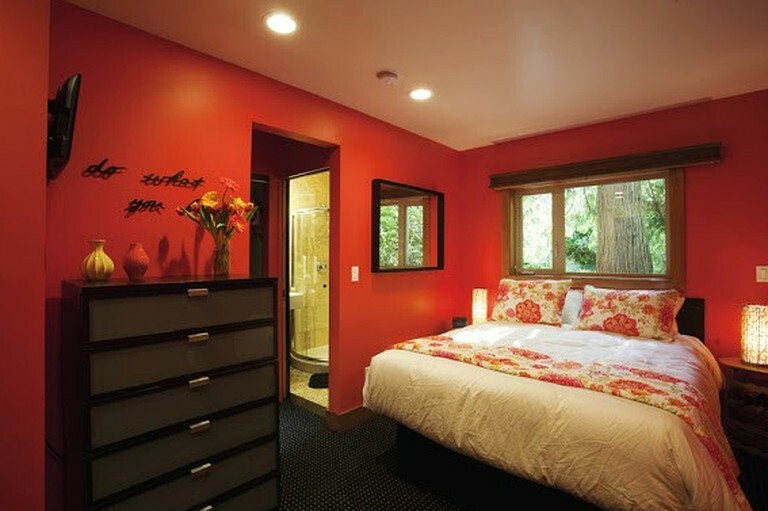 The bedroom also comes with cable TV, two USB ports for phone charging, a clock radio, and his-and-her reading lamps. An alarm clock is provided so glampers can get up early and watch the sunrise over the stunning cedar trees, with a hot cup of coffee. Upstairs guests will find the dining bar with seating for two people, plus an outside table and chairs on the lower patio for dining al fresco. The comfortable living room is where guests will truly feel as if they were staying in a tree house. The large windows look out at the surrounding trees and the birds that call this wood their home. There is a large, cozy sofa where guests can relax with a favorite book, a glass of wine, or simply gaze out at the stunning, peaceful surroundings. There is a modern, private bathroom, with high ceilings and smart tiling. 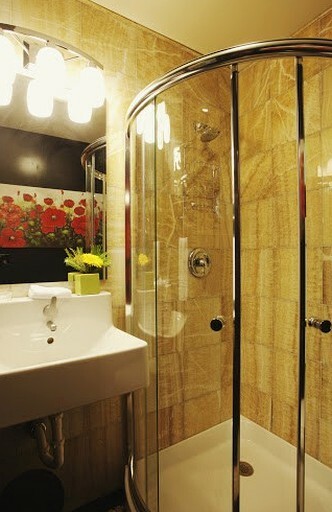 It has a full-size shower and plenty of floor space to move, despite its compact size. Hand and body towels are provided. The laundry area has a full-size clothes washer and dryer and comes with detergent, so guests needn't worry about bringing their own. An iron and board are also available, should guests wish to straighten up before going to dinner in the city. The full-size kitchen has everything a professional chef would look for. With an electric oven, a microwave, a fridge, and a gas top stove for cooking, guests can whip up everything from pancakes to steak. Pot and pans, waffle iron, coffeemaker, toaster, utensils, plates, and even plastic wear and paper plates for picnics are all available. Glampers just have to supply the food and the cooking talent. The cabin also has a dishwasher, so guests never need to worry about who is cleaning up every evening. The lower story has a gravel patio where guests can relax outdoors, the upper story has a bridge leading to a path connecting to the lower patio, but this bridge also doubles as a picturesque decking. An outdoor electric grill is available should glampers wish to have a summer BBQ. 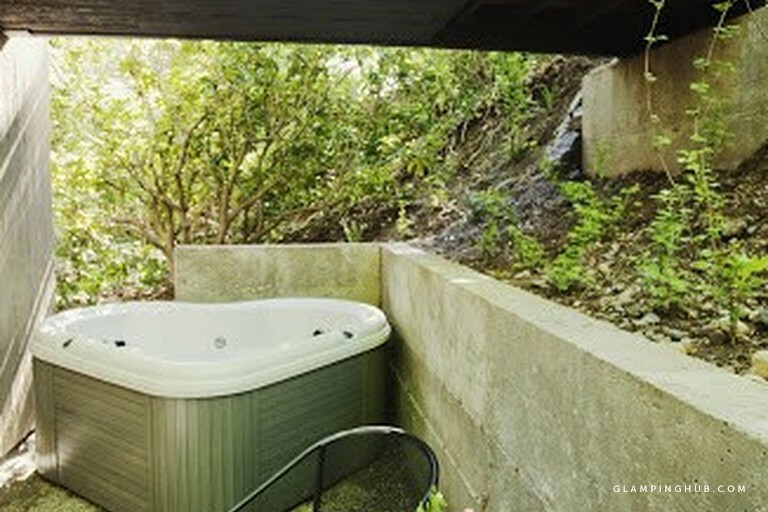 An attractive two-person spa, nicely tucked away on the lower patio just outside the bedroom. 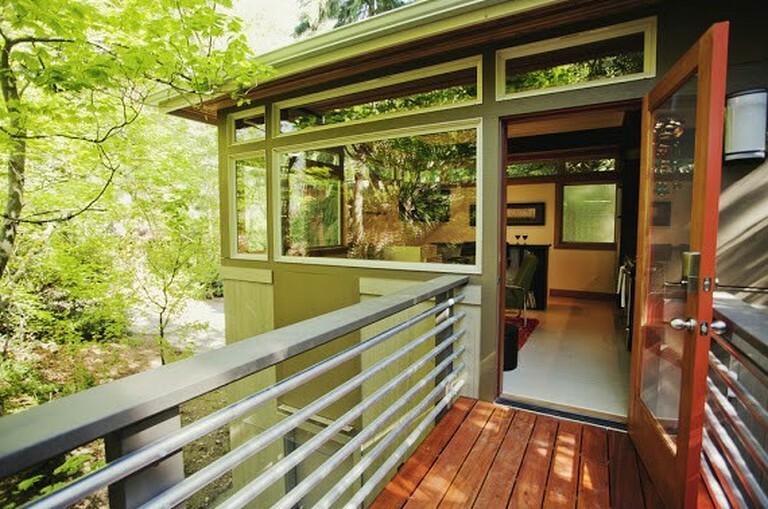 It's private, nestled amongst the native foliage, so guests can truly appreciate the beauty of nature surrounding them. This property gives a very unique Northwest experience. Seattle is full of little gems tucked away, not many available to the traveler to live in. 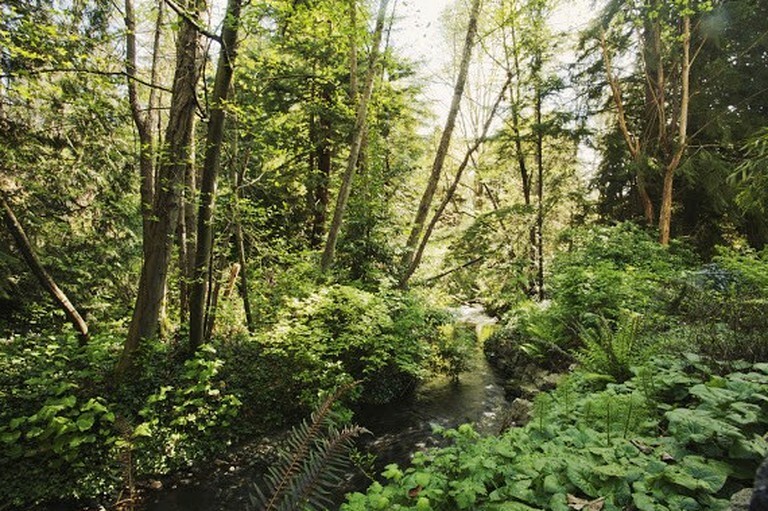 My property is located in a deep ravine listed as a Critical Environmental Area. Although the Tree House is close to the road, it's still buried amongst the towering trees, giving it the privacy a thick Northwest forest provides. Walk to the back of my property and guests will be overwhelmed by the acres of untouched nature and year-round creek; truly a calming environment. There are not many areas glampers can be in the “woods” and still be in the heart of the city, 10 minutes (on a good commute, 20 on a bad) from downtown. There is one spot off street parking, but plenty of on-street parking for guests. If guests have a large item with them (i.e. : a canoe, paddle board, etc. ), the host has a safe outdoor area for storage. On-site massages are also available. Please ask the host for details and pricing. 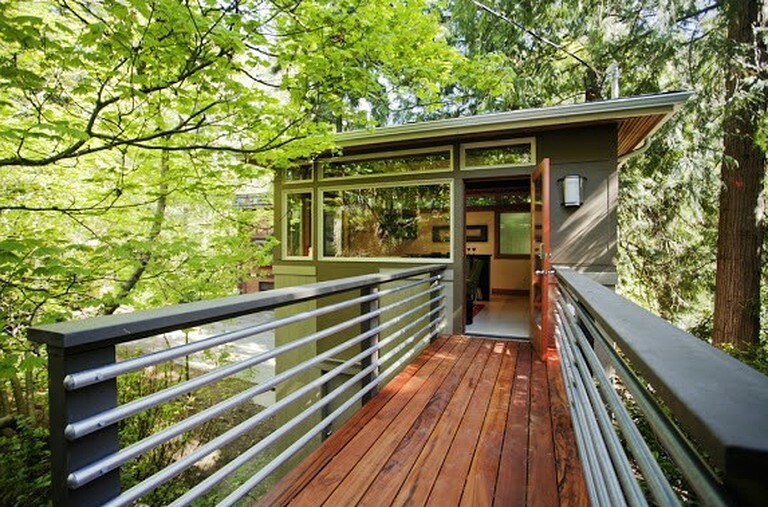 This urban tree house is private and secluded, yet only 10 miles from downtown Seattle and minutes away from Lake Washington. 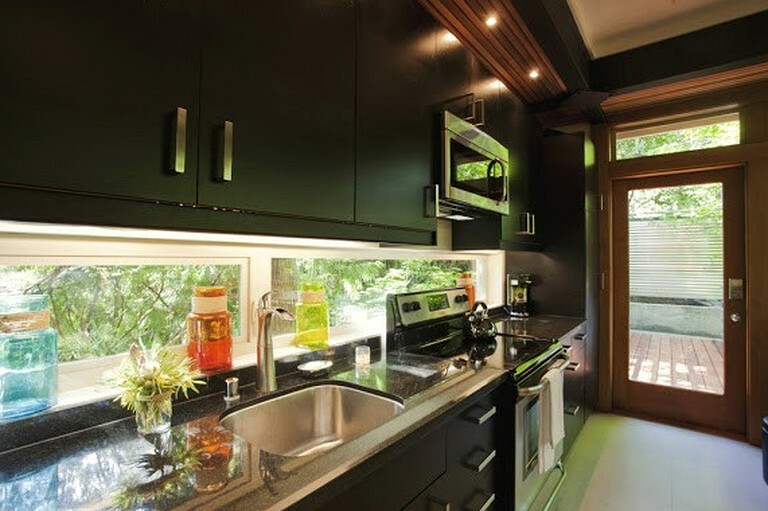 Custom-designed to take advantage of its unique environment, the house sits in a ravine slightly below road level, surrounded on all sides by western red cedars and big leaf maples, providing ease of access with the privacy of a natural, leaf-shaded canopy. In this woodsy location, the Tree House’s contemporary design inside and outside emphasizes its location in a setting that is both rural and urban, the perfect blend for experiencing Seattle. Well located for exploring the city, or as a jumping-off point for exploring the surrounding area. For those wanting to experience Seattle like the locals do, the Burke-Gilman bike and walking trail is an easy mile from their home. 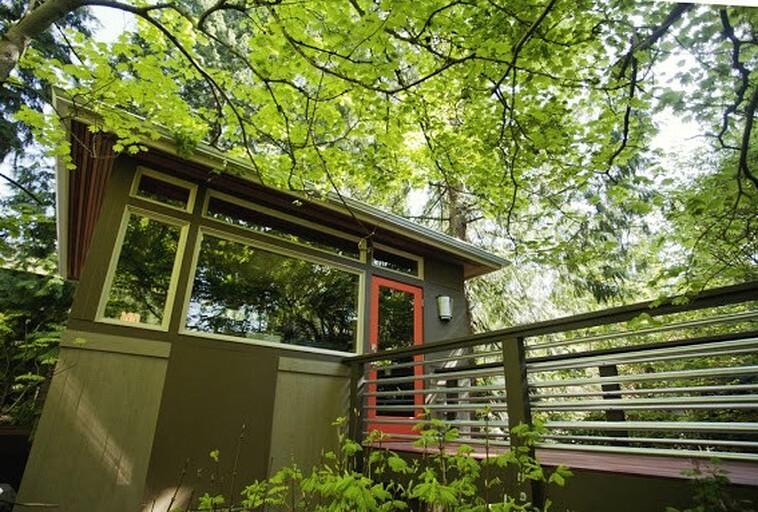 The trail connects to countless others, taking guests to the wine country of Woodinville and Redmond, the sand beaches of Golden Gardens, boat rentals at the University of Washington, or touring neighborhoods throughout the city. Lake City has its farmers market on Thursdays, a great place to stock up on fresh produce, meat, and flowers, or to get a bite from one of many food vendors. Many neighboring areas have farmers markets on other days throughout the week. Seattle has so many festivals, events and activities to enjoy year-round, and this location provides easy access. Just step out and explore! Guests should know that rates differ during high season. No smoking is allowed inside the property. When booking this luxury rental, please be aware that this is an urban accommodation in the city of Seattle, and as such, guests can expect mild street noise and lights.